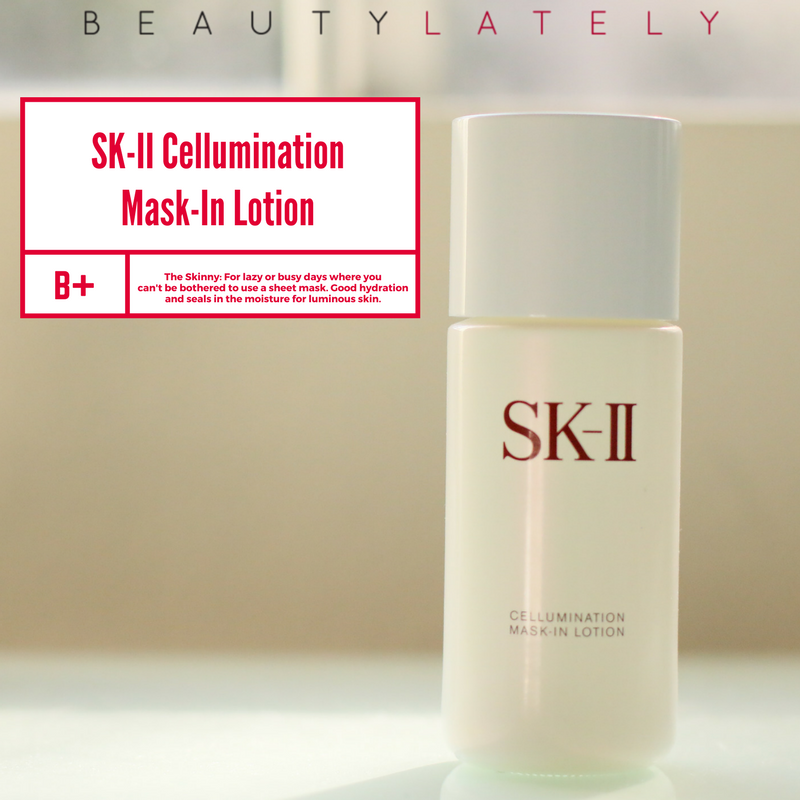 I picked up the SK-II Cellumination Mask In Lotion after looking high and low for a serum/mask hybrid that I can use for days when I don’t have time to use a sheet mask, but want the effects of using one. The Sales Associate at the Duty Free shop in Japan explained that this is meant to replace sheet masks on days where you don’t have the time or patience to use sheet masks. The benefits – brightening, softening your skin, preparing your skin for next steps in routine. It’s meant to be used before the SK-II Facial Treatment Essence. Effectiveness: I definitely notice my skin being softer and more hydrated after using this. I still think using a sheet mask gives more hydration. There just isn’t a replacement for a good sheet mask session that can be achieved by a product like this, in my opinion. The reason why sheet masks work so well to seal in hydration is because there is a protective layer to prevent the moisture from evaporating too quickly off the skin. I would use this daily, but still sheet mask 3-4 times a week. Size and Price: SK-II is a higher end luxury skincare brand, but I have to admit for a mask-in-lotion that has Pitera as a key ingredient, the size and price ($80 for 100ml) of the product didn’t send me running for the hills like some of their other products. I’ve been using this product for over 2 months now, and I am happy with the overall state my skin is in, although I can’t attribute it all to SK-II, since I have a myriad of other products in my routine. Conclusion: I would repurchase this item as a serum to keep on hand the next time I was traveling and could pop into a Duty Free Shop, but I wouldn’t go looking for it state side in a hurry. SK-II products are pricey and I’m skeptical of any skincare product that claims to brighten immediately, and this product definitely did not have immediate brightening effects. Hydration and overall glow I can see, but brightening takes more time. I also have not noticed dark spots lightening up like the claims, but to be fair, no topical skin cream or serum has been able to do that for me. Where this product does shine is keeping skin overall in a healthy, hydrated state. It’s pleasant to use, and my skin hasn’t had any adverse reactions.